Our marketing folks are now going to call Lotus QuickPlace, QuickPlace instead of whatever bland and insipid name that had been previously mandated. IBM Lotus Team-Workplace-something or-the-other? Similarly Sametime will now be called Sametime instead of "IBM Lotus Instant Messaging and Web Conferencing". For a while the Lotus in that designation had been deprecated. This probably portends that our marketing teams now better understand how to sell the Lotus portfolio. A few years ago, the perception from the trenches where I live was that there was a rush away from the land of Lotus simply because (in my estimation) it wasn't understood or didn't mesh well with the compensation structure of our sales teams. Presumably we've adjusted and now understand what these products are capable of instead of dismissing them out of hand. "For those unfamiliar with Notes/Domino, my handwaving elevator pitch is that it is a platform essentially based on the fundamental insight that a huge class of applications can be built based on just a few compositional building blocks: Forms, Views and a standard file format, the note in Notes terms. The brouhahas made about messaging, security, directory services, and all that paraphernalia that marketing people throw about when they pitch the platform to you are all syntactic sugar around the core competency of Forms and Views and the client and server processes that can manage them. A whole cottage industry of business partners are doing very fine thank you building custom and evolvable applications for businesses, small and large, everywhere. The fact that email can be construed as a forms application is just a side benefit and detracts from the real focus of the platform. This is much misunderstood by people whose only encounter with Notes is as a Mail client. It's really just a forms and view app for people and processes. Incidentally this same platform is most likely what is funding my current work and much of the IBM Software Group, even as resources are spent on other "sanctioned" and more "strategic" approaches. C'est la vie." Some of us who had to jump through hoops to get static ip addresses like [redacted] were a little disgruntled for a good 15 minutes. Mr Feinberg even brought Godwin's law into the mix albeit with a smiley at the end of that invocation. Now this was probably just a case of run-of-the-mill miscommunication, but let's remember that simple things like naming bring out the tribal instinct in people with sometimes shocking reactions... A lot of goodwill could well be lost. The identity of a community is to be found in the most unlikely of things. The things that draw people together to form a cohesive whole are not the explicit things that one thinks, it's not a kind of warlike territoriality or dedication to some mission statement or other, it is rather in small insignificant items that the tribal instinct is articulated. People will rally round the most surprising items (Elian Gonzalez, OJ Simpson, Teri Schiavo) and they quickly become litmus tests. Think of some of the most intractable political conflicts (say Serbia/Croatia/Bosnia or and here I hesitate, I wonder who else will have an Israel/Palestine category on Blogcentral) and wonder whether the political, religious or economic arguments were really the cause of the conflict or if there weren't instead some more mundane hurt feelings that then blossomed into what we have seen and subsequently rationalized by opportunist political or religious hacks. 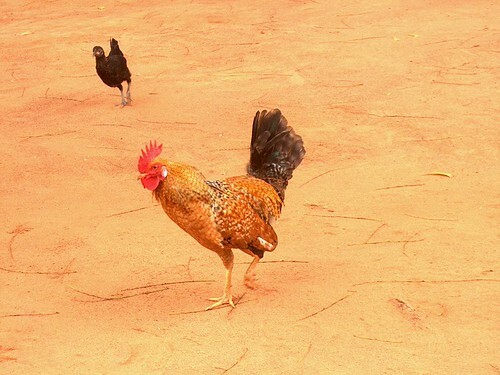 Or take this example form my part of the woods: for the past 9 years, Northern Ghana has been in turmoil because of an argument at a market stall over a chicken or guinea fowl (the historians will have to figure this out at some point). Two ethnic groups, the Dagbons and the Kokonbas who have lived peacefully together for centuries are now in open dispute. Many, many lives have been lost, and a huge amount of money, goodwill, diplomacy, cajoling and outright bribing has had to to done to try to cool things down and to get that part of the country to begin to contribute again to the rest of the community. This in a place that can ill afford such distractions. Now in my analogy, the guinea fowl is the stand-in for the name or for a dns entry. All this to say that when nurturing communities, it is best to keep such sensitivities in mind and call things by their names. If not all those Sensational Fruity Delights might come home to roost.